One of the best things about St. Patrick’s Day is that you don’t have to be of Irish heritage to celebrate and enjoy the festivities. Although St. Patrick’s Day began as a religious feast day for the patron saint of Ireland, today many Americans embrace the spirit of the holiday and become Irish at heart for 24 hours, wearing green and feasting on Irish fare. While there’s no corn in corned beef, the meat gets its name because most corned beef cuts are briskets that have been brined, or “corned.” To make corned beef tender and flavorful, a gentle, long cooking method is recommended, which makes corned beef and cabbage the perfect recipe for a slow cooker. Just pop the ingredients into the slow cooker on St. Patrick’s Day morning and your festive meal will be ready at the end of your day. If you don’t have a slow cooker, you can always make corned beef and cabbage on the stovetop or in the oven using a braising method. There are also lots of delicious options for corned beef leftovers. You can make corned beef sandwiches with hearty mustard on crusty bread or reubens with Thousand Island dressing, sauerkraut, cheese, and rye bread. Or, use the leftovers to make corned beef hash as a special treat for lunch, dinner, or breakfast. If you don’t want to cook corned beef but are looking for another traditional Irish dish, try colcannon, which is a comfort food combination of mashed potatoes and cabbage. Although colcannon is often flavored with ham or bacon, you can easily leave out the meat for a vegetarian dish. Not a cabbage fan? Try substituting kale for the cabbage. This traditional Irish bread employs baking soda instead of yeast, which gives it a unique taste and texture. Because you don’t have to wait for the bread to rise, Irish soda bread recipes are usually quicker to make than traditional yeast breads. Try a basic Irish soda bread recipe, or this version this version with currants. 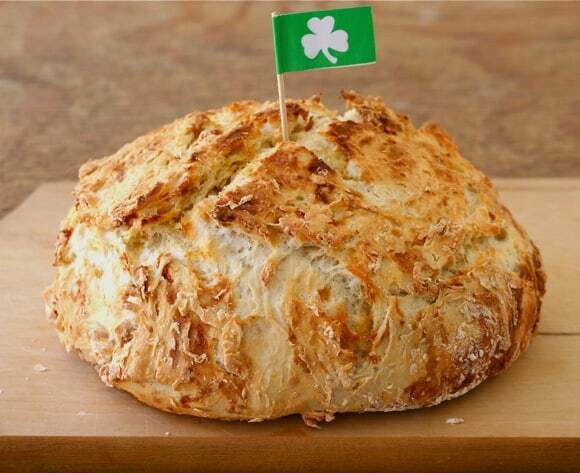 Serve Irish soda bread alongside corned beef and cabbage or colcannon, or toast it for breakfast with butter and jam. Thick slices of Irish soda bread make a great base for sandwiches, too. There are a lot of good reasons to cook Shepherd’s Pie besides celebrating St. Patrick’s Day. In addition to being comfort food at its best, Shepherd’s Pie is a one-dish meal, a great way to use leftovers, and you can make it ahead. Although it’s called a pie, this is actually a savory dish made with meat, potatoes, and vegetables. There are many variations and you can adapt the ingredients to your own taste. The basic method for Shepherd’s Pie includes some type of browned meat (ground beef is popular in the United States, lamb is often used in Britain, and you can also use chicken or turkey if you wish to lighten up the dish a bit.) The meat is usually browned with onions, garlic, and seasonings to give it flavor, and then is mixed in with gravy to keep the base of the pie moist. Vegetables are usually added to the meat and gravy mixture. Traditionally, peas and carrots are included (frozen vegetables work well for this if you’re looking to save time), and corn, mushrooms, and even green beans are often added as well. Some Shepherd’s Pie recipes include fresh or canned tomatoes in the base. The meat, gravy, and vegetables are placed in a casserole or oven-safe dish and topped with mashed potatoes, to which an egg and cheese are sometimes added. Then, the entire dish is baked in the oven until the meat is heated through and the potato top is golden. For a different twist, you can use mashed sweet potatoes for the top. Start with bowl of mashed Yukon potatoes. Add sour cream, cream cheese, cheddar cheese, chives, egg yolk, teaspoon of salt, and teaspoon of black pepper and stir until smooth. Heat oil in skillet over medium-high heat. Add lamb and cook until browned. Pour off any excess grease, and season with salt and pepper. Add tomatoes with liquid and vegetable medley and cook for 5 to 10 minutes. While that is cooking, in a small saucepan heat beer and add beef bouillon. Bring up to a simmer and add cornstarch mixture. Then add that to lamb mixture and simmer until thickened. Grease a 9x13-inch baking dish. Pour in lamb mixture. Spoon mashed potatoes over and make sure the potatoes cover all meat mixture. Top with 1 cup cheese and sprinkle paprika over the casserole. Pre-heat oven to 350'F. Cook covered with foil until hot. If the the ingredients are still hot when it goes in the oven, bake 25-30 minutes. If the casserole ingredients are cold, bake for about 45 minutes. Uncover and place under broiler until cheese is bubbly and golden, about 2 minutes. It’s hard to find anyone who doesn't enjoy the sweet, buttery goodness of freshly made shortbread. Serve shortbread for dessert as a perfect ending to a heavy meal, by itself or with ice cream. Or, put shortbread on a decorative plate and serve it with coffee or tea for a mid-morning, afternoon, or bedtime snack. If you don’t have time to try a new recipe this St. Patrick’s Day, there are some other easy ways to get the day off to a festive start. Add a drop of green food coloring to the milk at breakfast, or make green eggs or pancakes simply by mixing in a few drops of green food coloring to your scrambled eggs or pancake batter before cooking. Decorate the table with green napkins, placemats, or candles. For a special St. Patrick’s Day centerpiece, arrange shamrocks, Bells of Ireland, or white flowers with green foliage, tied with green ribbons. Make sure to wear something green or to accent your wardrobe with a green scarf, socks, jewelry, or other accessory to show your St. Patrick’s Day spirit. Preheat oven to 300 degrees. Line two baking sheets with parchment paper; set aside. In the bowl of an electric mixer fitted with the paddle attachment, cream together butter and sugar. With the mixer on low, slowly add flour. Continue mixing until dough comes together to form a ball. Transfer dough to a lightly floured work surface; roll out dough to about 1/4-inch thickness, dusting rolling pin with flour as necessary to prevent sticking. Using a 2 1/4-inch round, fluted cutter, cut out dough. Transfer to prepared baking sheet, spacing about 1 inch apart. Gather up any scraps, gently re-roll, and repeat cutting process. Take care not to overwork dough. Transfer baking sheet to oven and bake until shortbread just begins to turn golden, about 30 minutes. Transfer cookies to a wire rack to cool. Shortbread may be stored in an airtight container for up to 3 days. For more great recipes using your favorite home appliances, check out Healthy Meals Made Microwave Fast.